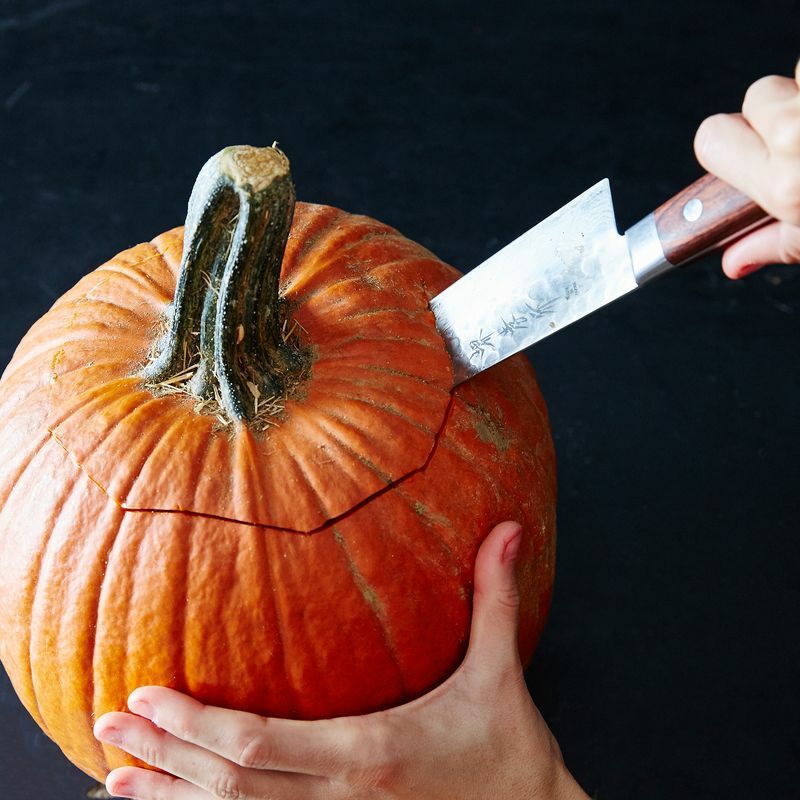 Slice the stem section off of your pumpkin by cutting around that part at an angle, so the tip of your knife points towards the pumpkin's heart (sorry again). For your safety, I suggest slicing away from yourself. Cut the guts off the lid and set aside for toasting into a snack. 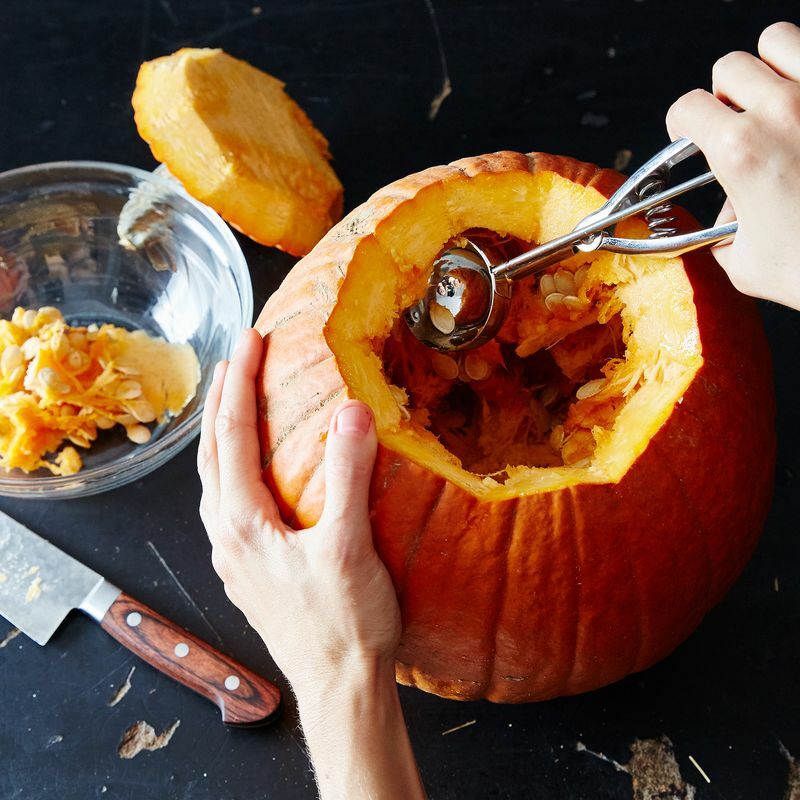 Using the ice cream scoop, scrape away the guts from the sides of the pumpkin. (Other spoons work as well, but I found that the sharp-ish sides of the scoop made it very effective at getting the pumpkin very clean, fast.) Once they're all scraped down, pull the gunk and seeds out with your hands. You can start with whatever drill size makes you feel most comfortable, but I have to be honest that the larger bits, even if they feel more intimidating, are the easiest to drill with. 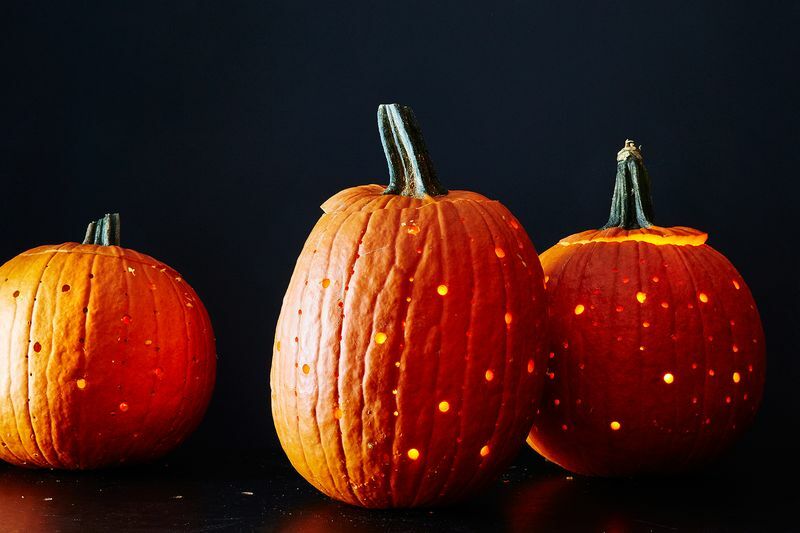 I used a range of sizes (from about 1/8-inch to 1/2-inch) to make holes all over in a completely random pattern, but you could be more methodical and make little columns down the natural ridges of the pumpkins, or even use the bits to make dotted lines and shapes. Random is easiest (and, in my opinion, cutest!). 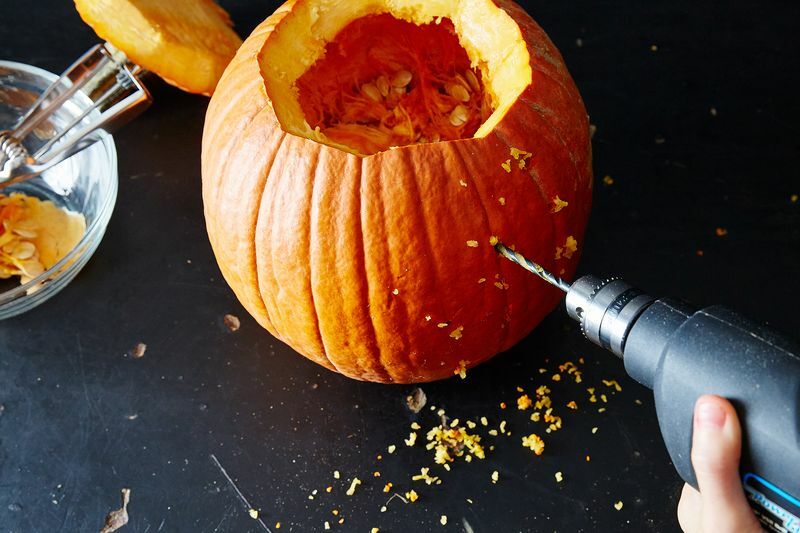 For safety, I'd suggest holding the back of the pumpkin with one hand, starting the drill, and pressing it into the flesh on the side closest to you. It's an absurdly satisfying feeling and very easy to do—so don't be discouraged if you've had bad experiences with power drills in the past! Once you think you have enough holes, make some more with your largest-sized bits—the tiny holes are cute as background illumination, but don't let very much light out, so I found that I needed many more punctures than expected to get the twinkle effect I wanted. 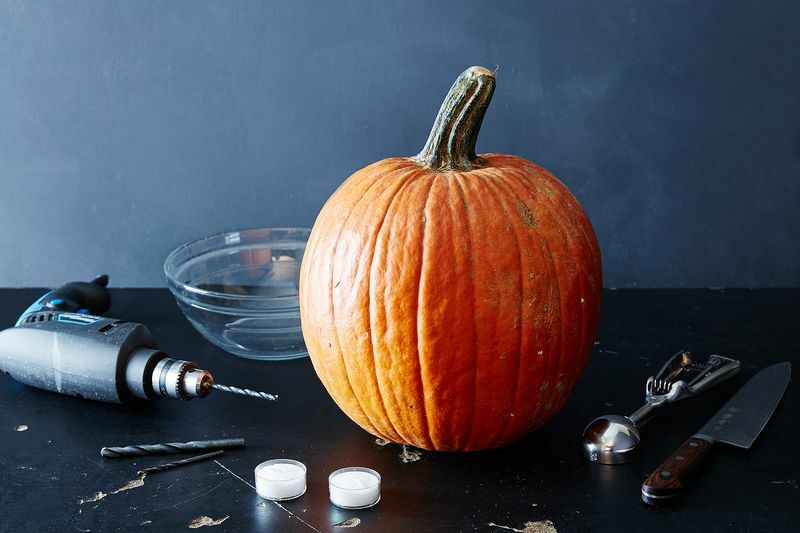 Put a few votives inside, top your pumpkin with his lid hat (a little akimbo so that the candles don't get snuffed), and watch any nearby wall turn into a twinkly wonderland. We originally ran this post last year and brought it back in case our stoop needs a little added twinkle. Halloween is on the horizon—how do you decorate? Let us know in the comments. I did this on Monday morning and have never had more fun carving pumpkins. Thanks you! I did one with just holes everywhere, and then I drilled my kids' names each into their own pumpkin. It looked so good! My pumpkins received many compliments, which has never happened before. These look so cool! Another idea for how to light these: Use one of those small, cheap press on/press off LED lights that are about 3" across. Safer and longer lasting than candles, and no wires to worry about. Could also use the battery-powered LED strands. Many come with a timer. If you go this route (LED vs. candle) could carve hole in back vs. cutting around stem. I love this idea! Definitely on my list for the weekend!